The total number of victims surpassed those suffered by the Titanic (1.514), the Lusitania (1.198) and the Bismarck (2.200), combined… times two. With these figures, the sinking of the Wilhelm Gustloff is undoubtedly the worst naval tragedy in History and it should be as famous as the three aforementioned, but its fate is barely known. As a matter of fact, I can almost assure that most of my readers have never heard of it, simply because the moment and the circumstances, in which the disaster took place, have relegated it from the first pages of history. The Wilhelm Gustloff was built in the shipyards of Blohm & Voss and launched on the 5 of May 1937 in Hamburg, Germany, as a pleasure cruise for the “Kraft durch Freude” (Strength through Joy) the nazi organization in charge of all aspects of leisure in German society at the time. In Summer 1939, it was sent to Spain to bring back the members of the Condor Legion which had helped the nationalist side during the Civil War in that country. In September, once the World War had started, the ship was requisitioned by the Kriegsmarine and became a hospital ship, task which performed until 1940, when it was assigned to serve as floating barracks in the Polish port of Gdynia, at that time part of the Third Reich. 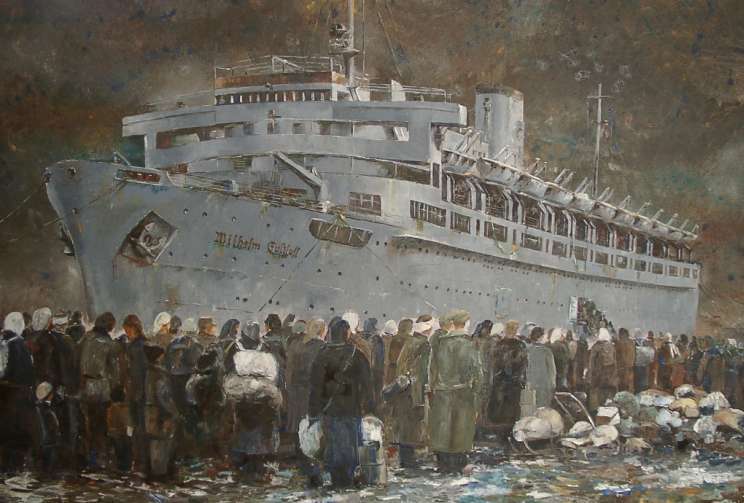 The Gustloff did not see any naval action in the following four years but, in 1945, near the end of the war, it was reassigned as a refugee transport for those escaping the advance of the Red Army during Operation Hannibal. Related: When a destroyer attacked a submarine with potatoes. In January that year, Russian troops had come from the East in the last push against Hitler’s forces that so brutally had invaded Poland and the Soviet Union a few years earlier. It was just a matter of time for the first Russian tanks to enter Berlin and finish the bloodiest conflict in Human history. The Germans withdrew behind a fierce resistance, but the lack of equipment and personnel had reduced its fighting capacity and all they could do was to delay the inevitable to give some time for the rescue of the thousands of Germans in the Curland Peninsula and Eastern Prussia. That would be the task of the Gustloff in Operation Hannibal. 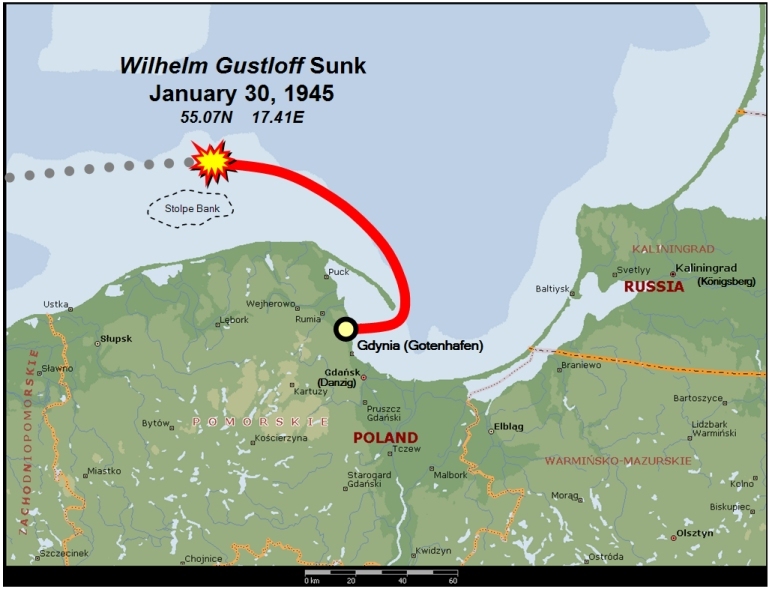 Even though it was built with room for 1.850 passengers, the official boarding list of the Wilhelm Gustloff on the 30 of January, climbed to 6.050, including 173 members of the crew, 918 military personnel between officers and students of the Submarine School at Gdynia, 373 female naval assistants, 162 injured soldiers and the rest civilians who had been chosen among the tens of thousands who crowded the docks and the rest of the port. At the last moment, however, approximately 4.000 people more were able to board without a permit in which would be their last chance to escape the Russian onslaught. Heinz Schön, a German archivist who survived the sinking, carried out an extensive investigation which led him to believe that the Gustloff had 10.582 people on board when it left its moorings. That fateful Tuesday, the ship set sail with its human load on its way to Kiel, on the North Sea. Two torpedo boats and a cruiser escorted the transport, but they had to turn back to port due to mechanical problems. The Gustloff was alone. It was a freezing morning as any other in the endless Baltic winters, with temperatures closet to 0º Celsius, fog and strong winds, but which should not represent an obstacle for a ship of that size. More fearful was the possible presence of Soviet ships or submarines in waters near the coast. It was this fear that led the captain of the Gustloff to follow a lane through deeper waters, in spite of the warning by a submarine captain on board, who advise him not to do it. In any case, the first hours of the voyage went by without a hitch. Nobody could expect a naval tragedy and, as the darkness of the early night fell, all lights were switched off for security. 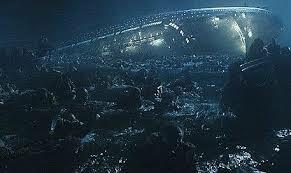 A mysterious incident that no one has been able to solve changed the destiny of the ship and its passengers. Not long after sunset, Captain Friedrich Petersen, received a radio message which alerted him of the presence of a convoy of German mine sweepers in the area. To avoid the collision, Petersen ordered to switch on the navigation green and red lights, making the ship visible. The brief investigation carried out after the accident revealed that there was no such convoy and the origin of the message could not be found. Nevertheless, the lights alerted its presence to another ship operating in those waters: the Soviet submarine S-13, whose Captain, Alexander Mariniesko, decided to follow the Gustloff for a couple of hours until finding a more suitable place to attack. At 21:00 hours, three torpedoes from the S-13 hit their target on the German transport, sending it to the bottom of the sea in 50 minutes. Of the more than ten thousand passengers, only 996 were rescued by German boats, the rest died at sea whether because of the explosions, drowned within the steel or frozen in the Baltic waters, so cold, that there were blocks of ice floating around the place of the tragedy. 1) most of the passengers were shelter from the cold in the lower compartments. When they attempted to escape, they had to climb up several levels to the exterior decks but, the high concentration of people transformed the stairs in death traps where the desperate men, women and children pushed and stepped on each other trying to save themselves. 3) the explosion of the first torpedo obliged the captain to close the prow’s watertight holds, trapping and sentencing to death many of the crew, those who could have helped during the rescue. The nazi propaganda machine under the helm of Joseph Goebbels chose not to make much of the wreck of the Gustloff to avoid adding more desperation to a nation already in hard times. The cascade of bad news during the Winter and following Spring of 1945 did the rest to bury the tragedy in the annals of history. Among the total of 50 million deaths during World War II, nine thousand more were only a fraction. The allies, preoccupied with the capture and trial of those responsible for the Holocaust, did not have the means nor the time to investigate a single event, even if it meant the largest naval loss of life of all times. The survivors were so traumatized by their experience and bent on rebuilding the country that preferred not to revisit the matter in an exercise of collective amnesia. We will never know the exact number of victims in the Wilhelm Gustloff, vicissitudes of war, but there is no doubt that we are dealing with the worst maritime disaster in history. Many of them were soldiers who gave their life in the line of duty, but most were civilians, women and children who understood nothing of politics or weapons. The tragedy of the Gustloff. the worst naval tragedy in history, may have been forgotten by most of the world, but some of us believe it must be remembered. Rest in peace. This entry was posted in Alemania, Articles in English, Blog, Grandes Éxitos, II Guerra Mundial, Nazis, Tragedias, Unión Soviética. Bookmark the permalink. ← ¿Por qué un Maratón recorre 42 kilómetros…y 195 metros? I knew about this sad history. It’s curious to see how tragedies can become as a good business if the glamour is in them (Titanic) or to be simply forgotten if it isn’t…life is life! Thank you very much for commenting. Best regards. Yo sí conocía la terrible historia del Wilhelm Gustloff, gracias a que nos la contó nuestro escritor Günter Grass en su reivindicación de la historia, alzando su voz contra la desmemoria y en sus críticas sociales y políticas. Ich wusste nicht das du Deutsche warst! Deine Geschichte ist sehr belastend, ein wenig traurig, aber mit der Komfort das du uberlebst hast. Ich freue mich das du hier noch mit uns bist, und ich hoffe das du andere Anekdote erzhälst. Die Tragödie der Wilhelm Gustloff war eine des traurigstes ereignis des Krieges, aber dank Gott diese Zeiten sind vorbei. Uiiii, das ist ja eine Überraschung! Vielen Dank für Deine Mühe, Jesús. Ich weiss, wie schwer es fällt, eine Fremdprache aufrecht zu erhalten, wenn man nicht mehr Gelegenheit hat, sie zu praktizieren. aber du kannst sie noch sehr gut. Deutsch ist eine sehr schwere Sprache. Ich habe sie viele Jahre hier in Spanien unterrichtet und kenne die Schwierigkeiten, besonders wenn man diese Sprache erst als Erwachsener lernen muss. Ich lebe schon seit 50 Jahren hier (me pescaron en la Barceloneta, me casé en Montserrat, tengo dos hijos maravillosos y ahora, ya jubilada, disfruto, y mucho, la vida.) Es ist schön, Personen zu treffen, mit denen man seine Interessen teilen kann. Es muy edificante!! Un abrazo redondo y que podamos seguir disfrutando de tus artículos tan particulares. me encanta Alemania, país en el que viví hace muchos años y donde ahora incluso tengo familia. Es un placer y un honor tenerte entre mis lectoras (entre las favoritas, por supuesto), y espero mantengamos esta cordial relación durante mucho tiempo. Muy buenas tardes, Jesús. El placer es mío y todo un honor poder celebrar esta amistad tan edificante para mí. Me alegro conocer tus vínculos y los de tu familia con Alemania. Aunque debo confesar, que me siento mucho más en casa en esas tierras mediterráneas. A poco de venir aquí ya me sentí tan bien que afirmé de estar segura que en una vida anterior habré sido íbera ….jajaja. En ese sentido, un cordial saludo y un fuerte abrazo de una alemana celtibérica.